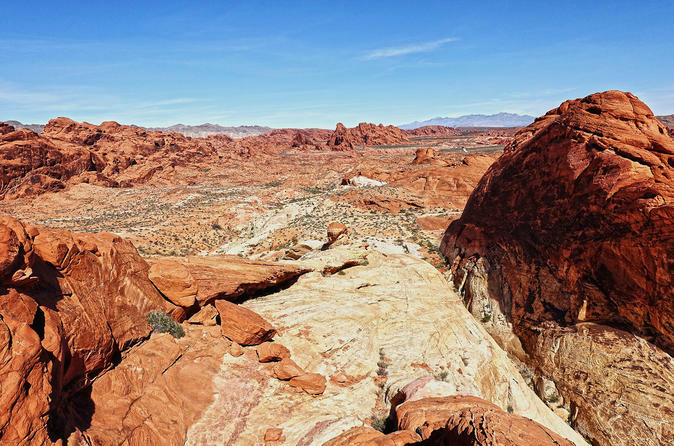 This private guided hike allows you to explore a multitude of trails and take in the breathtaking desert landscape of Nevada's first and largest state park, Valley of Fire. Our 5 hour excursions include expert local guides that will pick you up from your hotel, provide water and snacks along the way as well as let you know all about the history, wildlife and vegetation that can be found in our unique landscape. In addition to a picturesque hike through the vibrant and other-worldly sandstone formations, other highlights of this excursion are the Native American petroglyphs etched throughout the park and the Big Horn Sheep that call this place home. Choose from a variety of pickup times with availabilities both in the morning and in the early afternoon. Enjoy the changing scenery from The Strip to the desert landscape on the one hour drive to the Valley of Fire. Once there, you’ll have the chance to explore prominent and unique sandstone formations with opportunities to see desert wildlife. Explore the area’s history and check out Native American petroglyphs along with their possible translations. Whether you’re wanting a stroll through the park to enjoy the scenery or if you want to give yourself a little challenge, our expert guides can customize your experience to any fitness level. Snacks and waters are provided during this 5 hour excursion.